EMC Planning Group Inc. prepared an initial study and mitigated negative declaration on campus improvements as presented in a campus master plan. 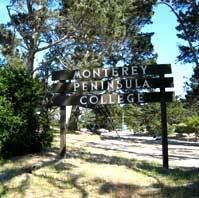 Monterey Peninsula College (MPC) is part of California’s public community college system and supports an enrollment of about 14,385 students. The college serves the communities of Big Sur, Carmel, Carmel Valley, Del Rey Oaks, Marina, Monterey, Pacific Grove, Pebble Beach, Presidio of Monterey Annex, Sand City, and Seaside. The MPC campus opened in 1947 in converted barracks buildings left over from previous military uses at the site. Since 1947, continued barracks conversion projects and construction of additional classrooms and buildings have led to the current configuration of 442,286 square feet within 32 buildings. The current building program is funded in large part by a local bond measure passed in 2002. In addition, state and private funding sources will help support upgrades financially. The community-supported bond mandate is to ensure that current life safety and universal accessibility codes are met on the campus, and that all academic and support buildings are equipped for their functions. The Master Plan identifies the concept of “Academic Neighborhoods” as fundamental to the master plan. There are six academic neighborhoods proposed, with existing and proposed buildings associated with each neighborhood: Performing Arts Center; Creative Arts Promontory; Math and Science Quad; Business and Humanities Cluster; Student Life Hub; and Physical Education Complex. The master plan also includes circulation and parking improvements. Environmental issues addressed in the environmental documentation included the following: construction-related impacts to air quality, noise, and sensitive vegetation and wildlife species (tree removal, streambed alteration, etc. ); lighting impacts as viewed from scenic State Route 1; archaeological resources; water quality; and traffic, circulation, and access.